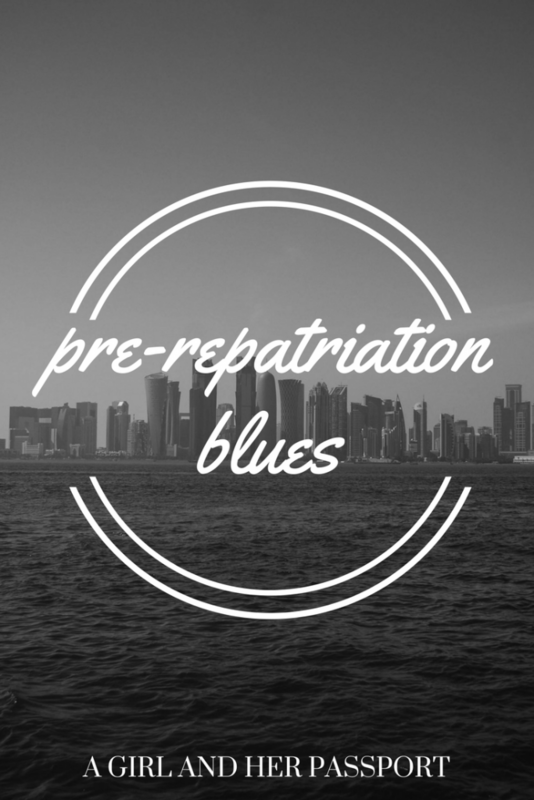 Many expats talk about the repatriation blues after they return to their home country. It can be hard to adjust to life back in your own country since it is now not the normal or having the excitement of moving to a new country. I have what I am calling the pre-repatriation blues. Since I am not technically repatriating, I am not even sure this is the right term! I am only returning to my home country to store my stuff and see my family. 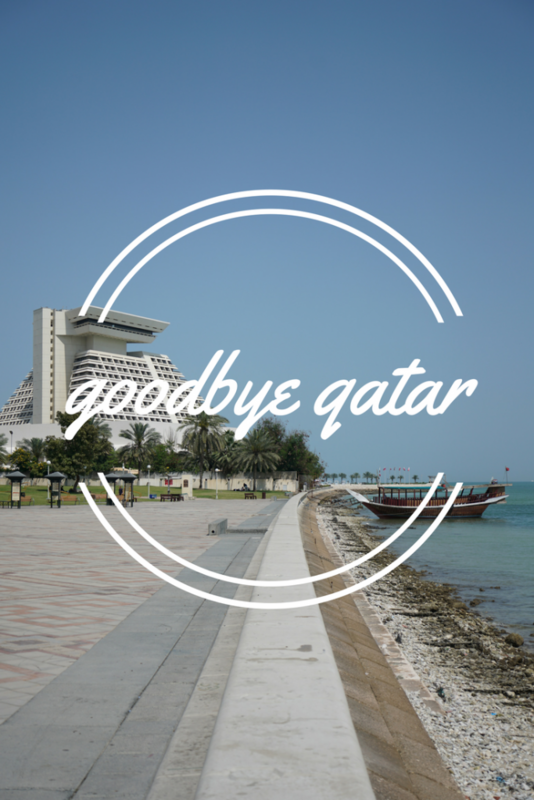 I am sad to be leaving Qatar. A few times right after I gave notice, I had the feeling I had made a mistake and that I shouldn’t go. It is hard to describe what I was feeling. It was a mix of anxiety, fear, and self-doubt. What was I thinking quitting this well-paid exotic local job? Then reality set in that, for me, living to work isn’t how I want to live my life. Then came the reaction to my post about quitting my job. I expected some sad reactions and a few supportive ones. I expected the people who disagreed with what I was doing would not say anything. Most of that happened, but I was overwhelmed by the statements of support not only from friends and family but total strangers. Then the sadness really set in as the more people you tell, the more disappointed friends, coworkers and students I encountered. They aren’t disappointed that I am traveling, but that I can’t stay and travel from Qatar. I have been on the verge of tears many times. One student insists on giving me a hug every time I see her. Who wouldn’t be sad to leave after all the outpouring of love! Just like with everything else, time helps. Every week gets easier, and I get a few more things checked off the long list of to-dos before I go. That last day, though, I am trying not to think about it. The next hurdle to jump is closing your bank account. That sounds so simple in theory. Go in and close it, right? Not so fast. First, you have to cancel your credit card. Credit cards here are attached to your bank account, so I can’t close my account till the credit card has been cleared for 45 days. Since I never picked up the credit card or activated it should be reasonable that I shouldn’t have to wait the 45 days, but no! So now I won’t be able to close my bank account until some time in late May. It isn’t the end of the world, but something I could take care of now. 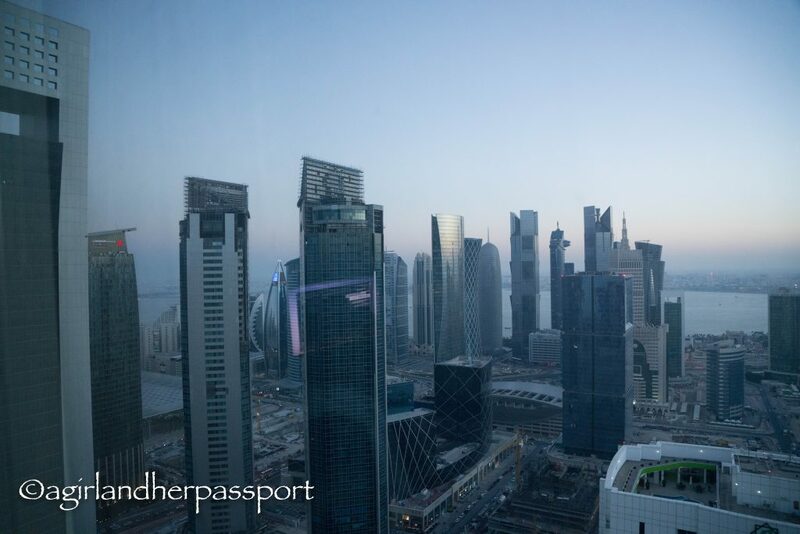 Qatar uses a sponsorship system for expats working in the country. Basically, my company sponsors me to be in the country. Part of that includes getting a residence permit. This also has to be canceled before I go. My company needs ten business days to do that. Then once it is canceled, I have seven days to leave Qatar. Not stressful at all! This means I will leave four days after my last day of work. Again, it isn’t bad as I have started to pack, but it adds some pressure. And I wouldn’t have to say goodbye! The other part of all this is that I am determined to return to the US in my suitcases and not have to ship anything home. I am ruthless when it comes to getting rid of my possessions. Five bags of clothes and shoes have gone out the door and countless bags of paper trash. The rest of it will be sold or given away before I leave. Packing has already begun, so that is the least stressful part about this whole situation. It also means I should know if I will need to ship some stuff. The only hard part will be getting it all to the airport. Have you moved back home after being an expat? 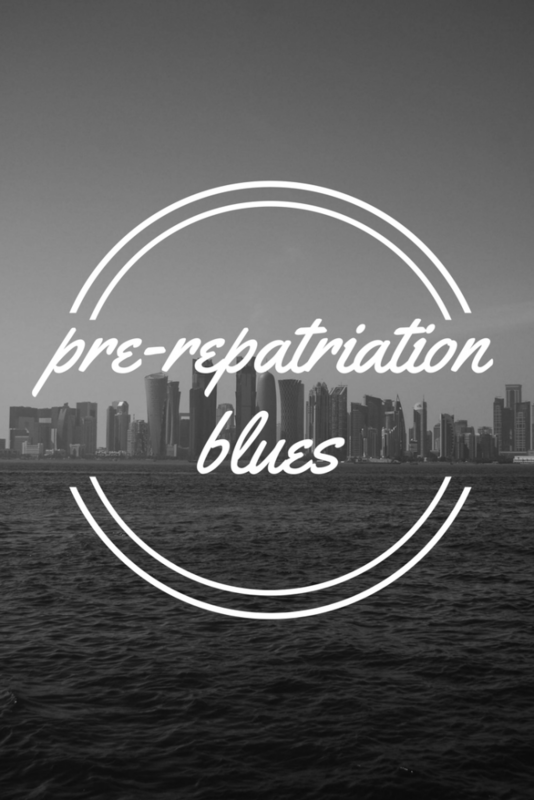 Did you have pre-repatriation blues? How do you know when it is time to leave your expat job? Expats around the world ask this over and over and most expats will tell you that you will just know. And it’s true. I knew a little while back it was time to leave Qatar and so about two weeks ago, I quit my job. At the end of June, I will leave Qatar. This was not an easy decision for me to make. The weekend before I gave noticed, I called my parents in a panic saying “This is a dumb decision, right? !” They assured me it wasn’t. My parents have been extremely supportive of this decision, as they have been with most of the decision I have made in my life. I know that if I don’t do it now, I may never get up the nerve to do this. There isn’t a specific reason for leaving, it was definitely a feeling of it was time to go. I have had the feeling before now several times and the feeling just wasn’t going away. Qatar has been a great place to live for almost four years. My job is great and so are my coworkers. Trust me this decision would have been much easier if I hated my job or my coworkers were terrible. I like them so much, that I had huge anxiety about telling them. I have been at this job longer than any job I have ever had and that is saying a lot for me. I will miss Qatar and everyone I have gotten to know. One of the hardest things is knowing that I may never see some of these people again. You may be wondering where my next job is or if I am moving home. But I will tell you there is no next job or repatriation for me. In my typical, not do anything normal way, I have decided to travel for a while. Yes, I am going to be one of those crazy people who quits their job to travel! This isn’t my first quit my job without another job venture and everything ended up fine with those too. I have an idea of what I want to do for work, but it may not work out or something else may come along. I want to give the blog more focus and see what if I can make it pay some bills. It may never be my full-time job, but I will never know if I don’t give this crazy thing a chance. That is the next question everyone has asked after hearing my plans. Nailing down a plan for long-term travel is hard and I want to not have a plan, but the planner in me is having a hard time with that! First, I will go home for a month because I have to dump all my stuff somewhere. Thanks, Mom and Dad, again! Then I head to London for a month. It has been over 20 years since I have been there and I am dying to go back. As you can see, I am planning on spending longer stretches of time in places. There are several reasons for this. One is that it is cheaper to stay somewhere long term than it is to stay somewhere short term. The other is that I really want to get to know the place and see it more as a local would. There are other things planned, but I want to keep my plans to myself for the moment. Don’t worry, I will tell you eventually! You will just have to keep reading to find out what those plans are. Over the weekend, I was invited by the InterContinental Doha the City to enjoy a staycation with them. The end of a semester is always stressful at my day job. Having a staycation is a way for me to relax and wind down without having to make travel plans or get on a plane. The warm welcome from the InterContinental Doha the City started even before I arrived when I received an email welcoming me to the Club InterContinental. 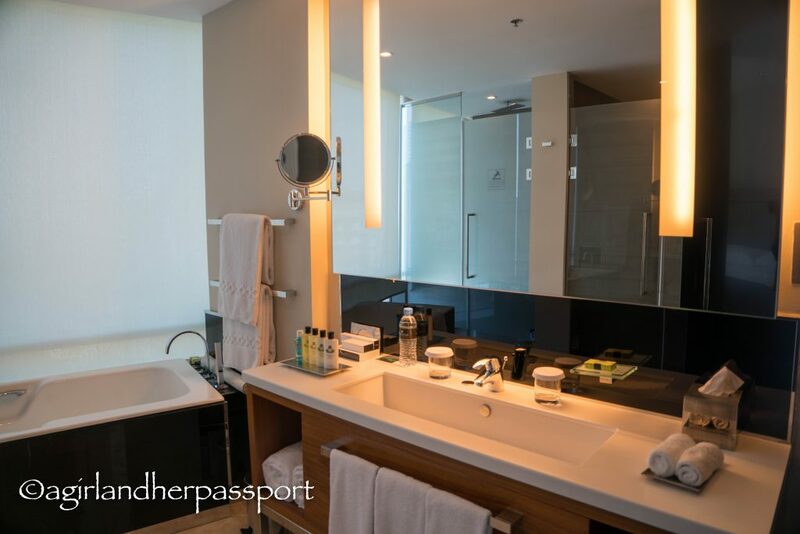 The benefits of staying there as a Club InterContinental member is that you get to check-in at the Club InterContinental on the 45th Floor, late check-out, afternoon tea, evening drinks and snacks. You are also able to use the club anytime. At the InterContinental you get the added best benefit of stunning views of West Bay! Light flooded the room from the floor to ceiling windows in the room. The views were just as incredible from the 42nd floor where my room was located. Besides the view, the next best thing was that when I shut the door, it was quiet. The noisy streets of Doha disappeared when I closed the door. The living room area of the suite felt like walking into someone’s apartment and not a hotel room. There were a small couch and a chaise lounge. The tv was across from these but not the focal point of the room, which I prefer. Next to this was a good-sized desk where there was both a Nespresso coffee machine and a tea kettle. The best part about the desk the plugs were built into the desk, and a universal plug was included! More windows greeted me as I entered the bedroom. 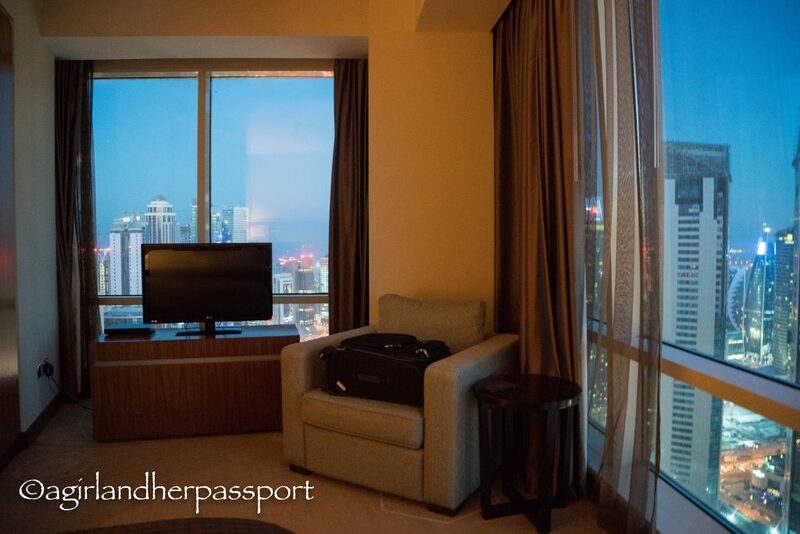 The king-sized bed was facing another tv and another view of downtown Doha. There is also a plush chair to sit in. Off the bedroom was the bathroom with, you guessed it, more windows! You can have a bubble bath and watch the traffic go by. The view extends into the shower, which is large with a rainfall option. Overall, I loved the room. The carpet was plush, the bed comfortable, plugs beside the beds, coffee maker and blackout curtains are all things I love about a hotel room. There could always be more plugs and the windows provided great views but did give glare off the tv. I wouldn’t trade the views for the tv, though! 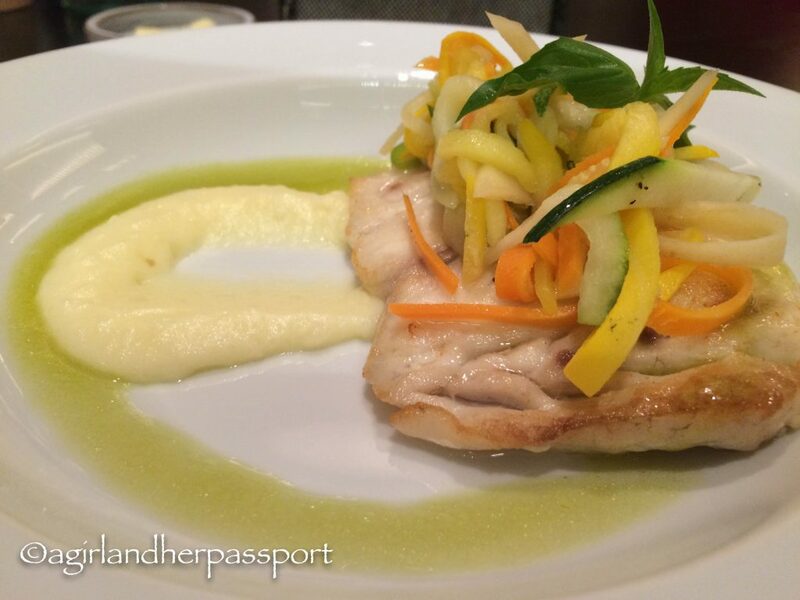 If you are going to a hotel for a staycation, then you probably don’t want to leave the hotel and to do that you need great food options. The InterContinental Doha the City does not disappoint. Since I was there on Friday, I was invited to have brunch at Hwang. Brunch is a traditional activity here on Friday. Hwang is Pan Asian, and the brunch is their take on Yum Cha brunch. Unlike the traditional buffet brunch, Hwang is a tasting menu that you order from, and they bring you as much as you like. Having only been to Hwang once before, I was eager to have the things I know I liked and to try new dishes as well. Not only was the food superb the service was excellent. The waitresses suggested items to try and made me feel like I was eating with friends. My favorite dishes were the Crispy Prawns with Wasabi Mayo and the Crispy Wok Friend Duck with Long Beans and Thai Basil. 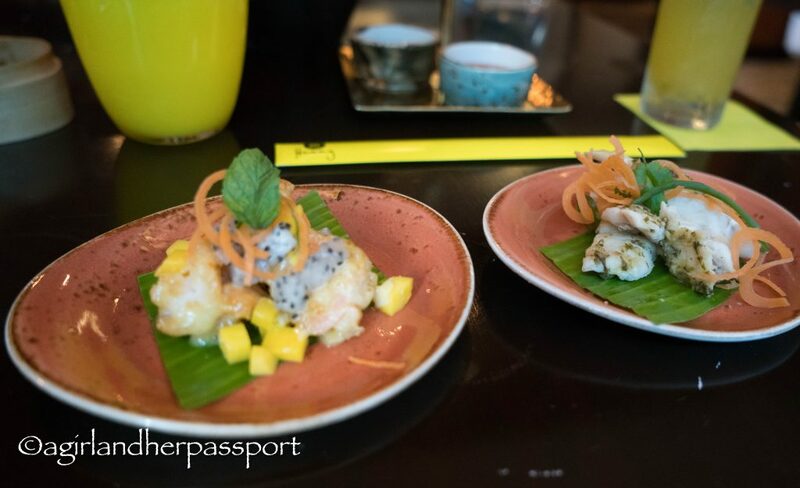 The brunch is reasonably priced at QR 228 with soft beverages, QR 328 with wine and beer and QR 428 with wine, sparkling wine, beer, spirits and cocktails. 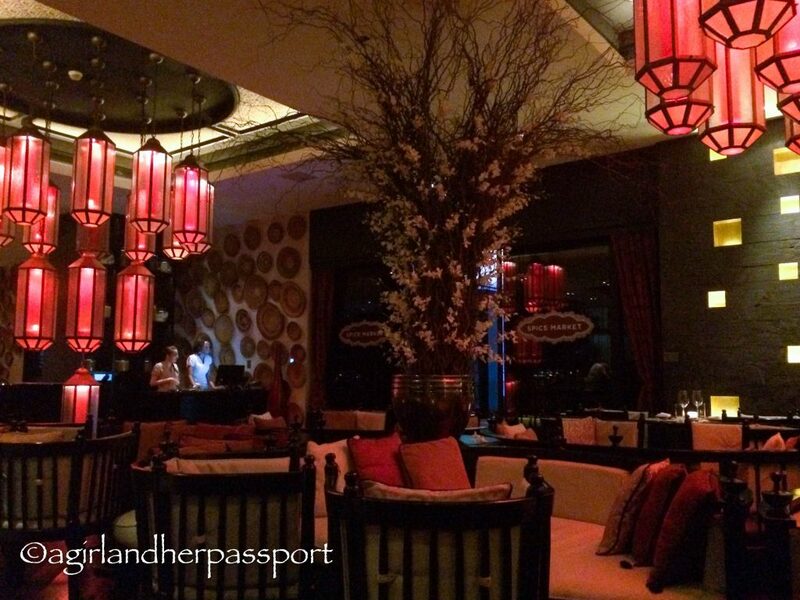 That evening I had dinner at Al Jalsa Garden Lounge. Now that the weather has cooled down in Qatar, this is an excellent option as it is outside. 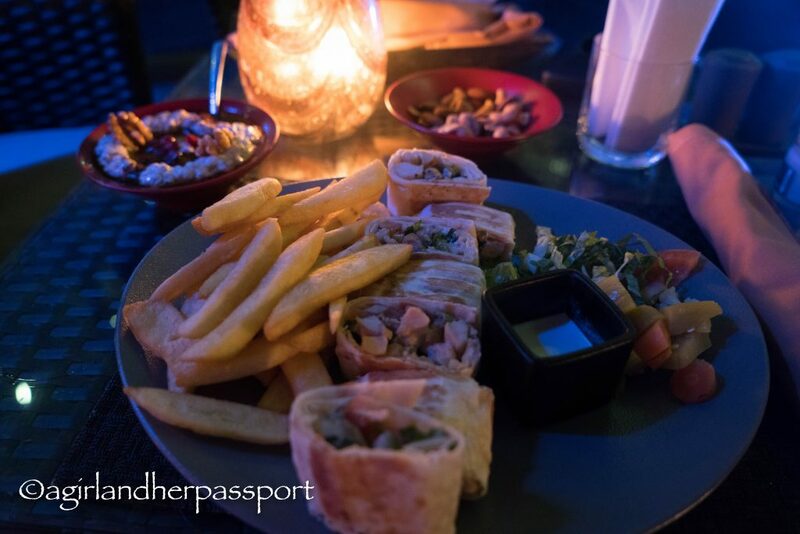 The offerings are mainly Arabic food and shisha is an option. The muttabel I had there is the best I have had in Doha and I have had tons of muttabel. You can’t stay in a hotel without enjoying the buffet breakfast. The wonderful service continued at The Square where upon entering they took my coffee and omelet order! Kids will enjoy this breakfast as much of it would be visible to them. In fact, I saw one little boy jump from his stroller when he saw strawberry milk. There are several more options in the hotel including Prime, the steakhouse, the lobby lounge for tea, Strata lounge and restaurant and Hive restaurant and lounge. You will never go hungry at the InterContinental Doha the City. 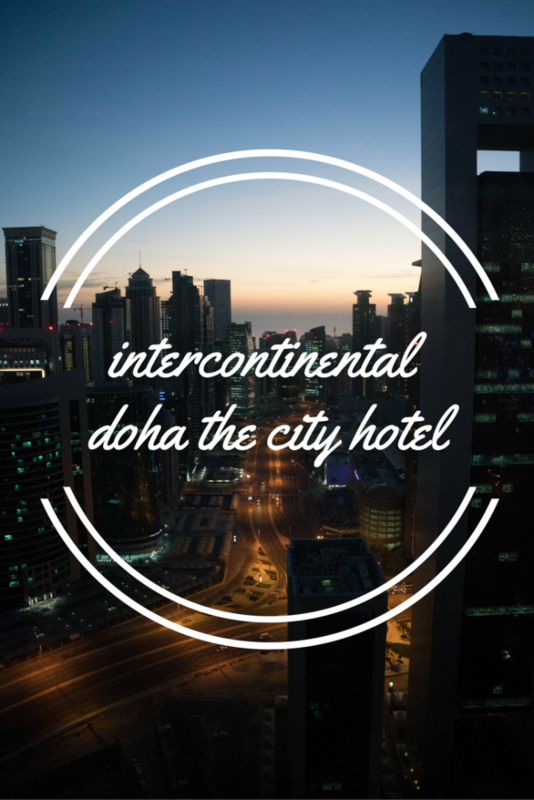 The InterContinental Doha the City is an excellent choice for a staycation or a weekend in Qatar, check rates here. Even if you decided to venture out from the hotel you are close to two malls, Katara, the Corniche and the amazing Souq Waqif. Sometimes you just need to get away from your normal, but you don’t have time to get on a plane and go to another place. If I was living the US, I might have considered a weekend road trip. However, I can’t go too far in Qatar and can’t cross the border. A staycation was in order. I had wanted to do a staycation for a while, but when I saw the weekend offer at the W Doha on their Snapchat, I was sold. 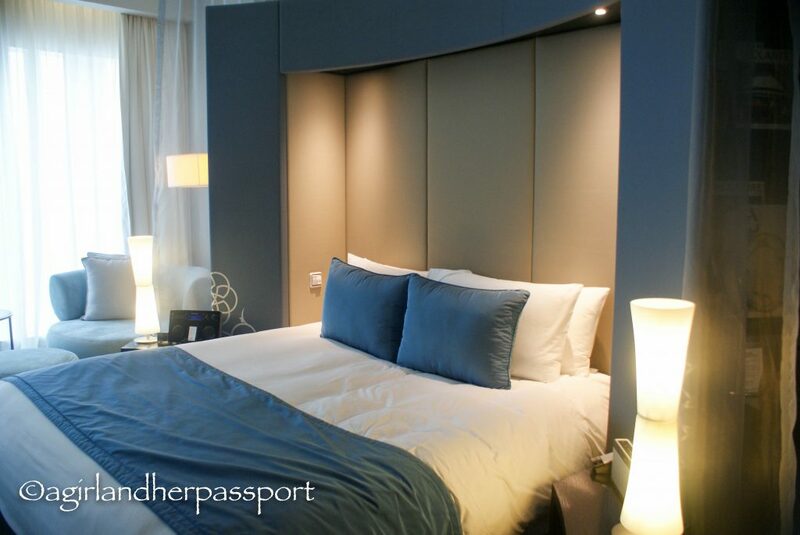 Currently, they have a weekend rate of 777 Qatari Riyals that can be used Thursday, Friday and Saturday nights. 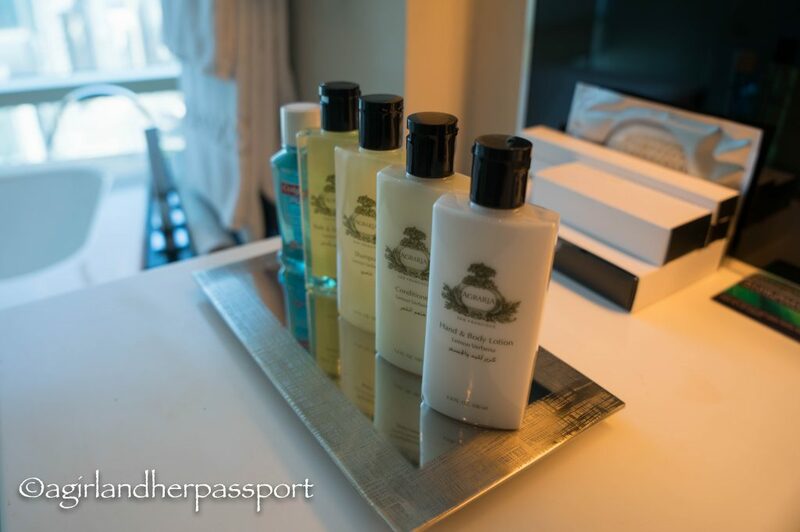 The best part is that you can check-in at noon and check-out at 6 pm the next day! It is almost two days in the hotel, and it includes breakfast. 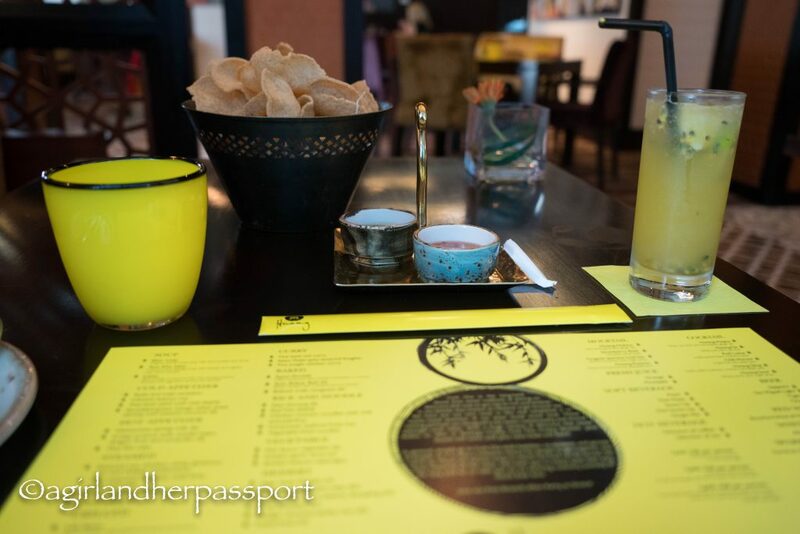 The W Doha was already one of my favorite places in Doha for food and drinks, so I wasn’t surprised by the excellent service I received right when I walked in the door. The service started before then even because I told their social media person on Snapchat that I was coming, and she said she would try to get me an upgrade. This stay was on me other than the upgrade. 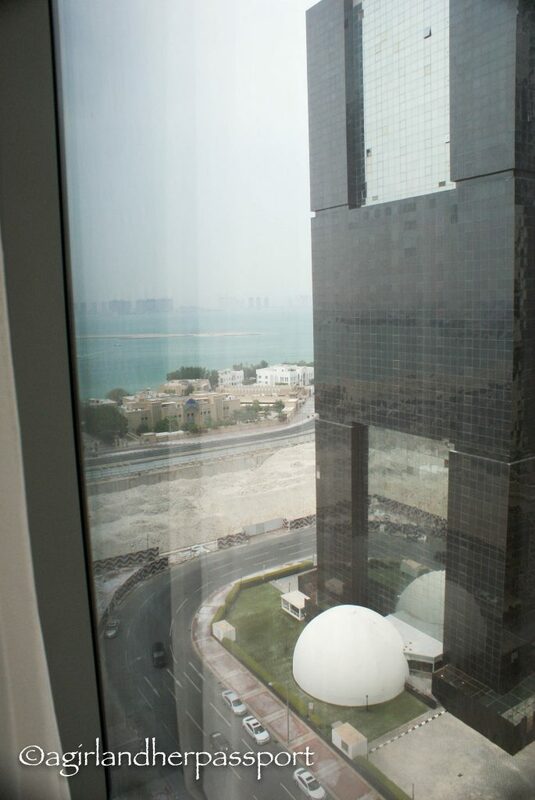 They were able to get me to a higher floor, which offered a nice view of the Arabian Gulf. Most W hotels are known for their modern interiors with bold colors, and the W Doha is no exception. The lobby is black and white with bursts of purple and hot pink. 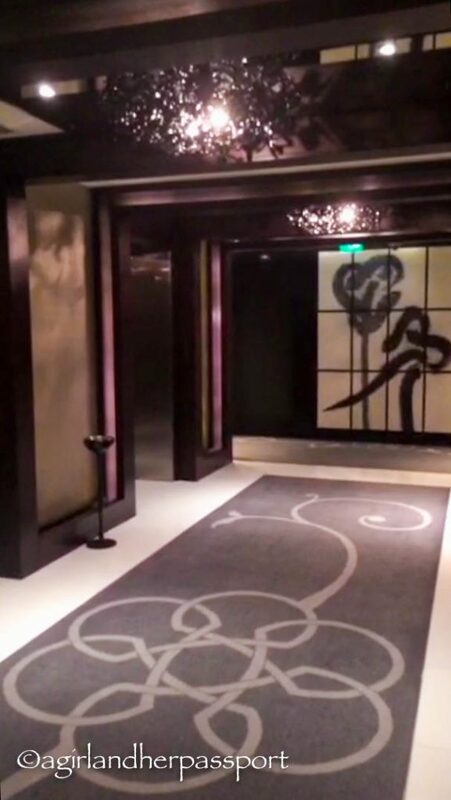 The hallways to the rooms are black and purple with black lacquer chandeliers. 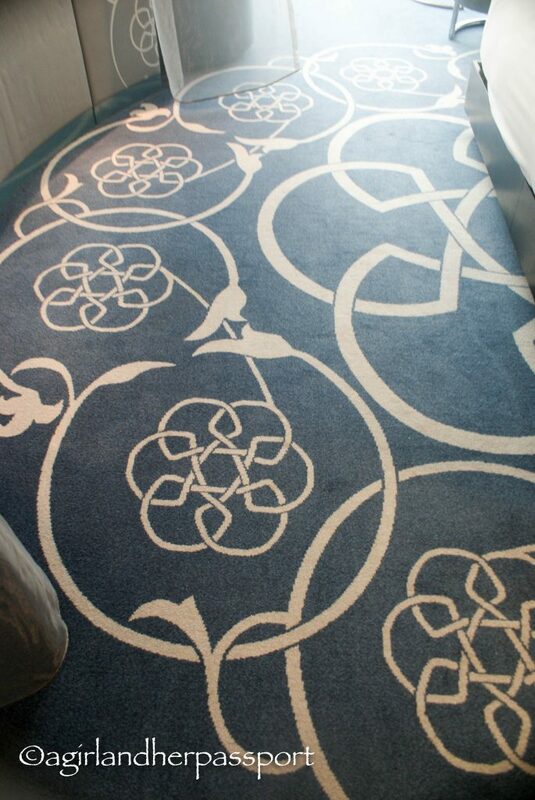 The bold colors extend into the room, but geared towards relaxation and sleep in shades of blue and gray. Once inside the room, I hardly heard anything from the outside. There is a lush, heavy carpet to dampen noise and floor to ceiling blackout curtains to block the bright Middle Eastern sunrise. The modern chair by the window made me want to sit there for hours watch boats zip back and forth. The luxury extended into the crisp, white bathroom and had one of my favorite things with the separate shower and bathtub. 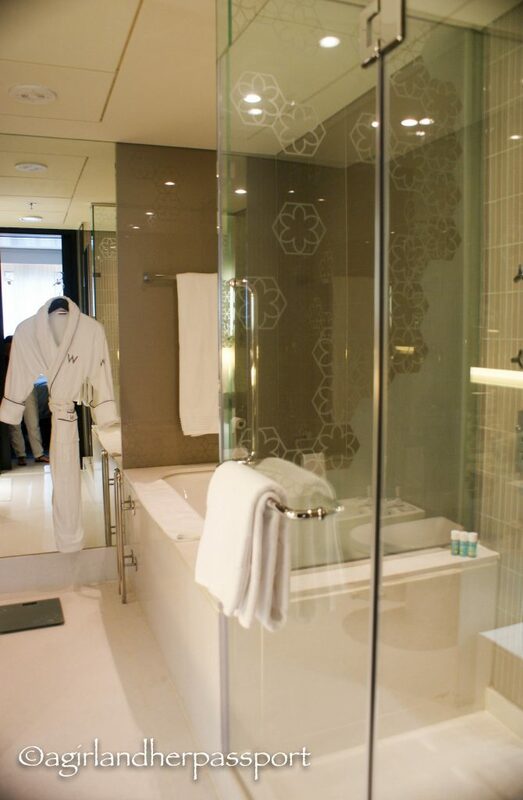 The W Doha also knows me well, and the bathrobe wasn’t gigantic and actually fit me. All the towels were large, and there was an abundance of them. 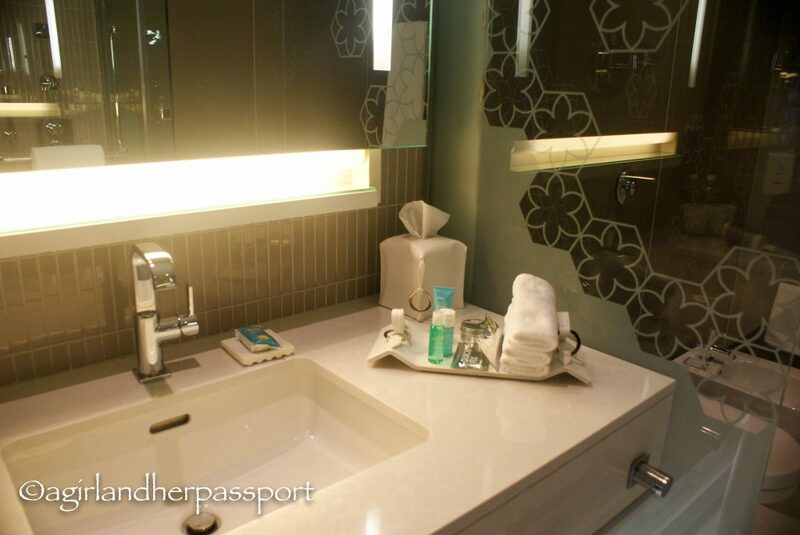 My favorite thing about the bathroom was the Bliss Spa products including shampoo, conditioner, lotion, face wash and mouthwash! After a nap, I decided to get ready for dinner, which included a long soak in that amazing tub! It is deep enough to cover your whole body with water. The only issue for me was getting out, which was difficult due to the depth of the tub. W Doha is home to my favorite restaurant in Doha, Spice Market. 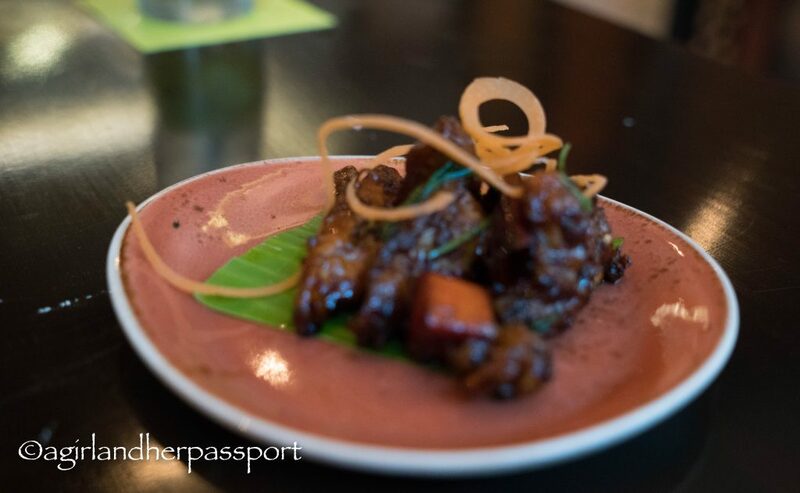 Spice Market is an Asian restaurant with an ever-evolving menu. Not only is the food excellent, but the service is also spotless. I decided to order something different than my usual and got the Miso Glazed Black Cod and a side of Steamed Edamame with Yuzu Butter. The other thing I appreciate about Spice Market and all the restaurants at W Doha is that they are willing to alter the food to your needs. As you may remember from a few months back that I am trying to lose weight, and I asked the Edamame to have the butter on the side. 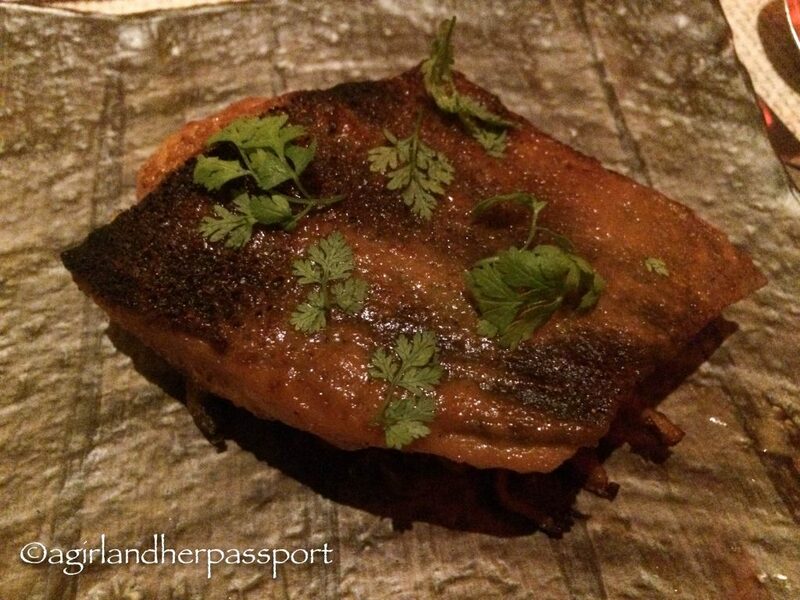 It was still excellent, though, and the fish was spicy and had a great crispy skin. Dinner wasn’t my only meal at W Doha, of course. I had breakfast and lunch at Market by Jean-Georges. Breakfast was a buffet, and you could order as well. I was disappointed by the breakfast buffet as there wasn’t much I could eat besides oatmeal and the fruit. I didn’t want to pay extra to order from the menu. However, lunch was fresh and light! I had the express lunch as it offered the best value for your money. 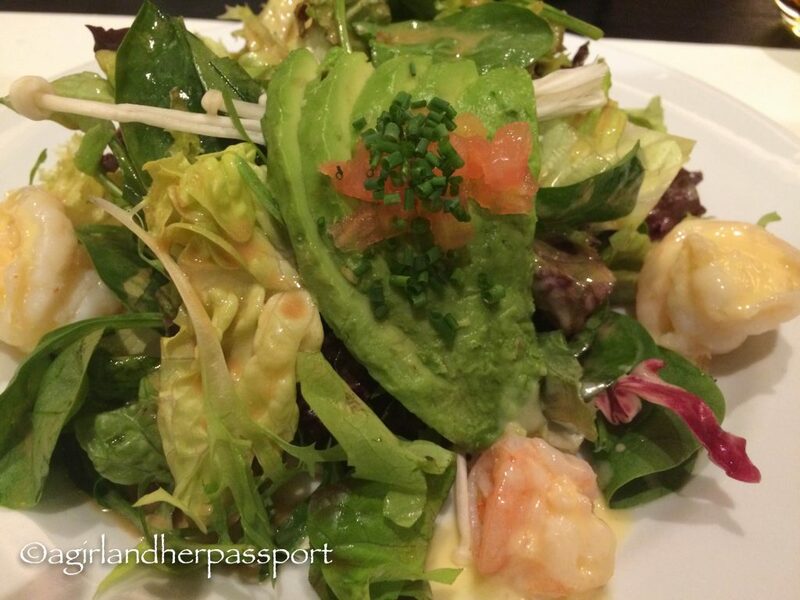 I ordered the Steamed Shrimp Salad, the Roasted Hammour and the Fruit Salad sans ice cream. Yes, I ate a ton of fish, but I loved it all! Both meals were just enough to keep me full without leaving me feeling heavy and sleepy after eating, which can be difficult eating at a hotel. After lunch, I enjoyed working at the desk in the room. Although, my one complaint was the only universal plug was inside the in-room safe, which meant I couldn’t work in the amazing chair next to the window. There was another nap in the extremely comfortable bed. Since I didn’t have to check out till 6, I strolled around the hotel later just to get some exercise. I did have access to the gym and the pool, but I decide not to try them out as the pool isn’t large and there were kids in the pool. As for the gym, I was just lazy! 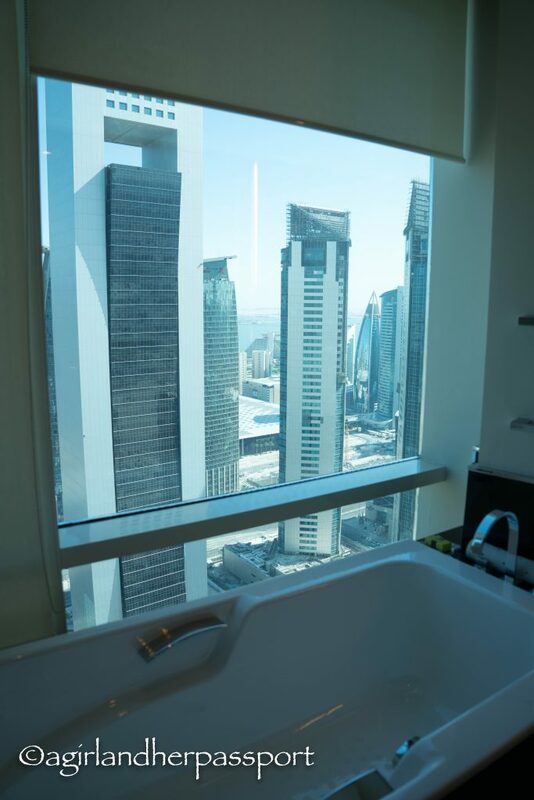 Even though I was still in Doha, I thoroughly enjoyed every minute of my stay at the W Doha and would happily have another staycation there in the future. Every staff person I spoke with offered excellent service, the food was outstanding, as always, and the rooms comfortable and relaxing! Have you taken a staycation? Tell us about your best staycation experience in the comments!